Day in History Print for Any Day. Imagine giving your customers or clients something that tells them via a timeline what happened throughout history on the day they were born, or the day they married. You can even add a short message to the bottom of the print to personalize it. 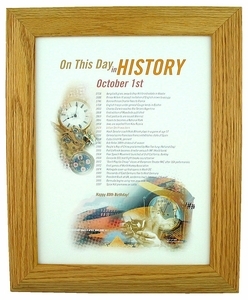 This day in history print does exactly that and is the perfect corporate gift. We can drop ship these day in history print directly to your customers, or we can ship them to you and you can present them to your clients around their birthday time. Can be created for any day. Contact Us for volume discounts.